Stan and I on Springer!! All the snow made us feel right at home. I cannot believe it has already been a week on the trail! But at the same time I feel as though we’ve been here forever. I have already learnt so much, met a lot of incredible people and even experienced some trail magic! 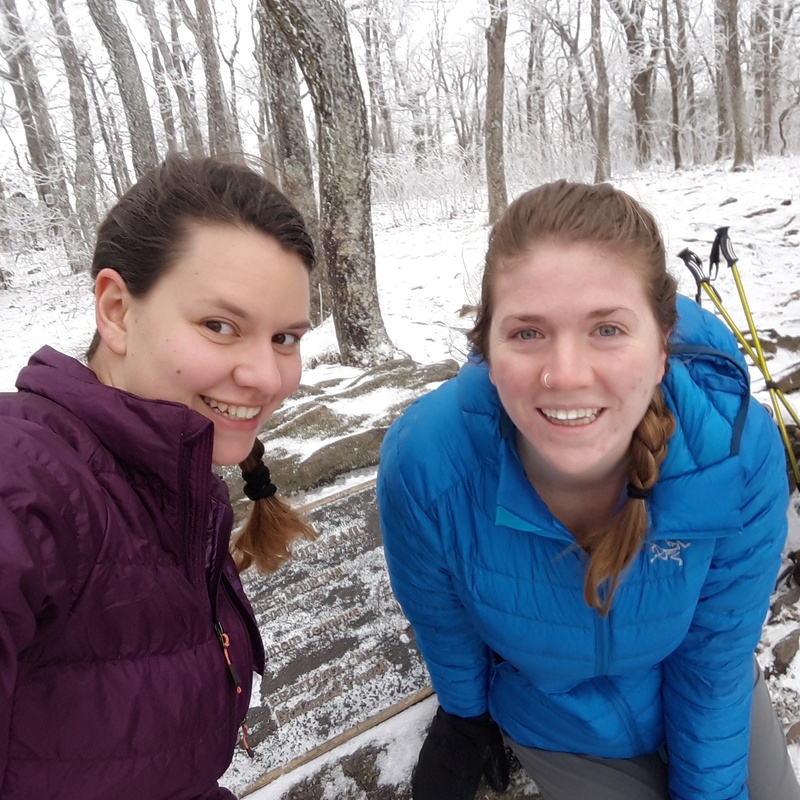 Fellow Appalachian Trials blogger, Victoria (Stan), and I left Toronto on February 24th (day 0) after many delays due to a snowstorm (I guess that’s what you get for starting in February!). We headed up to Springer the following day after an amazing stay at the Hiker Hostel (I’d highly recommend it to NOBO hiker). We were super lucky to miss a few days of bad weather and had an absolutely BEAUTIFUL start to our adventure. Our first few days in the trail felt a little surreal. We started off with some smaller miles (~8/9 mile days) to adjust to this new lifestyle. By day six we managed to pull a 15 mile day with some wicked elevation changes – it felt amazing to be able to go that far though! We are now 8 days and 69.6 miles in and spending the night at the Top of Georgia Hostel. How much time I have spent alone. Stan and I have very different hiking paces. She usually leaves a couple of hours before I do which leaves me with most of the day to get lost in my thoughts while I catch up with her. I love getting the time to reflect. How comfortable I feel around people I’ve just met. Whether it’s trail magic or some hikers at a shelter – I feel a lot less shy than I do in regular life. I love getting to connect with so many awesome people. How little I want to cook dinner. Just nope. I’ve used my stove a grand total of 3 times so far. I mean it’s very nice to have hot food but I’m usually to tired/lazy to do it. How strong I feel. Everyday I can feel the miles getting easier, faster, and so much more enjoyable! The people. I love that after having even a small conversation, people are so genuinely excited to see you again. We’ve started to form a little bubble, often camping with the same people each night. Getting my trail name. I picked out the most fun duct tape I could get my hands which features some pickles saying “Dill with it!” So that name stuck (see what I did there hah). How quickly my body is able to recover. Give it a little water, food, and sleep and we’re good to go! Being surrounded by mountains. So. Freaking. Amazing. Less is more. I was so worried about being cold that I brought way too many layers. You can have too much food. I dropped ~ half of my food at Neel’s Gap. Wearing your pack wrong is the worst. I discovered on day six my pack had been sitting too low causing my sternum and shoulders to bear most of the weight (imma dud). I totally knew better too! Today while we were resupplying in Hiawassee. Stan and I out ate Mountain Man and Blacktoe at an all you can eat buffet. That hike hunger tho. And while leaving Ingles, I may have made eye contact a complete stranger while trying to say “Let’s go” to Stan. I think I sufficiently confused the strange man. Yep, awkward moments define my life. For now I’m sitting in a very cozy common space watching the snow fall gently outside with Toast (also an Appalachian Trials blogger!! ), Mudpuppy, and Stan. We’re all very thankful to be in a warm building on this cold night. YO! I'm Dill - a 23 year old Canadian who is all about cats, puns, winter, and chocolate. In spring 2015 I graduated from Trent University with a BSc in Biology but I truly believe adventure is the best way to learn so... I'm currently doing a 2016 NOBO thru hike! It's inTENTse! I love to laugh and be silly. I just want to live a completely adventurous, passionate, weird life. Hey, Dill, thanks for the update. Point well taken on the excess layers and food. Have fun and be safe! We are so glad to read about your first amazing week. Love the pictures. Everyone needs some magic in their life. Great story about getting your trail name. It’s funny the things that will stick in people’s heads. They say that if you can make it to Neel’s Gap that you can make it to Katahdin and you’re way past that! Looking forward to the next update. Oh my goodness Lisa! Best trail name! From one corny gal to another, it is fun-knee! So glad to hear an update and know you guys are having a blast!